Why was Walt so careless in this situation? Why was Walt not concerned about getting dirt in the methylamine? Throughout Breaking Bad we are shown how pedantic Walt is with contamination. But in the train heist in season 5, we see copious amounts of dirt and what not get spilled into the tank for the methylamine. In this scene, around 2:10 to 2:30, we see a heap of dirt going into both barrels, one for the return water and the other to hold methylamine. 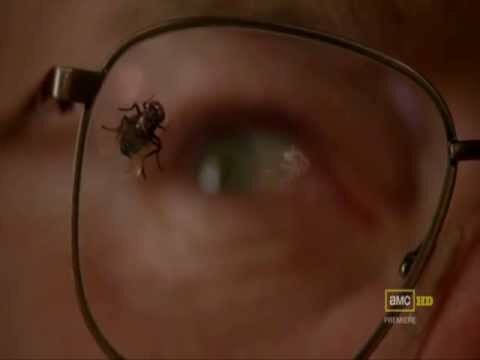 Throughout Breaking Bad we are shown how pedantic Walt is with contamination. The only time Walt is "pedantic" in the way that you reference is when he is in the lab cooking meth. *Note: and it's worth mentioning that episodes like 'The Fly', where Walt shuts down an entire lab session in order to chase after a fly isn't actually about the fly or contaminants, it's a metaphor for Walt's losing control. The train heist you mention involves capturing a massive amount of Methylamine, which is just used as a precursor for methamphetamine – Jesse and Walt use reductive amination of P2P (phenylacetone) to synthesise methamphetamine, to avoid having to rely on pseudoephedrine. Because methylamine has such a low boiling point, simply basifying the solution during distillation would readily separate the methylamine from anything else that could be present in the contamination. Considering Walt and company are risking getting arrested by the authorities during their train heist, and he is not actually cooking, just grabbing one of the ingredients, things like "Getting the job done as fast as possible" takes priority over a thing like Walter's penchant for being clean and pure during the cooking process. The writers could have added in the dirt and "carelessness" as a way to contrast it from Walt's usual behaviour when dealing with chemicals, thereby upping the tension and making the time-sensitivity dilemma all the more impactful to the audience, who, as you say, is not accustomed to this kind of "carelessness" from Walt. While Walt is indeed notoriously pedantic about the purity of the process (and its ingredients), the time constraint of the heist makes it virtually impossible to keep the product pure. Walt has all the time he needs to purify the product after the heist is completed, before he uses it for cooking. A recurring theme of the show is how often Walt's plans go awry in some way. It's what keeps the show exciting as we're forced to how Walt adapts and comes up with creative solutions. In this case, we have to understand that it's a time-sensitive heist. They are not used to performing this action and do not have the time to do it carefully. By lacking experience and time, it's realistic to say some dirt will spill. After all, Walt cares more about getting the methylamine and getting out quickly and quietly. They note many times how dangerous of a heist it is in the episode. Did the cousins intend to return for their Mercedes?